Sometimes all it takes to change how an image looks is removing a single item to alter its composition. At other times, you may want to remove a person or object that shouldn’t have been there in the first place. In both those cases the most important thing is that when you remove any unwanted item, you’ll want to make sure that it doesn’t leave behind any ugly traces or imperfections that could mar and detract from the image. Click on the ‘Browse for Images’ button and select the image that you want to edit. Open up the ‘Object Removal’ tab near the top. Select the ‘Brush’ tool on the right side, and use it to paint over the item that you want to remove as precisely as possible (or use the ‘Magic Wand’ tool to select it instead). Click ‘Start Erasing’ to remove the item that was selected. Use the ‘Stamp’ tool to cover up any imperfections. Click ‘Save As’ when you are satisfied and ready to save your image. Because of how easy Movavi Photo Editor makes it to select an item and remove it, you should be able to quickly remove any objects, people, date stamps or other elements that you don’t need. The key is to try to select the element as precisely as possible – even when you are attempting to remove text from image. To really improve how your image looks, you should also look into using the other features in Movavi Photo Editor. By applying them you could utilize various effects and filters, improve the quality of the image, fix common problems, insert customizable text, give people a digital makeover, replace the background, and much more. 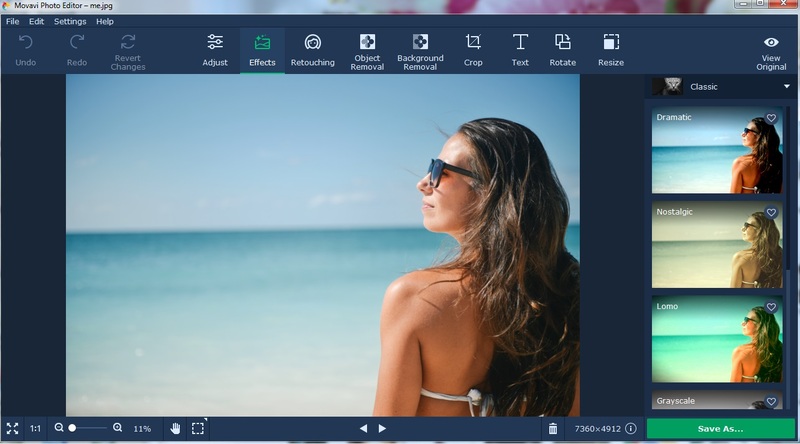 Although you may not have any experience editing photos in the past, Movavi Photo Editor will ensure that you find it a smooth and simple process. Just spend a few minutes with it, and you’ll be able to see for yourself how intuitive it makes photo editing and how much you can improve your images.